The federal government and the leadership of the Academic Staff Union of Polytechnics (ASUP) yesterday engaged in a hot exchange of words over who is to blame for the over eight-month-old strike by the polytechnic lecturers. ASUP members had embarked on strike on April 17, 2013, to press home their demands for government’s proper funding of polytechnic education and for parity between the polytechnics and university graduates in the country. 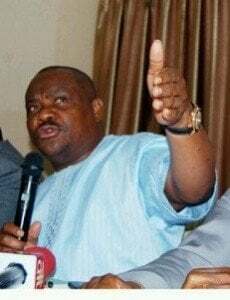 However, emotions flared up at a meeting called by the supervising minister of Education, Barrister Nyesom Wike, in order to resolve the gray areas of the demands of ASUP. Polytechnic students have openly accused the lecturers of pursuing their selfish agenda and using students as tool for negotiation. The tripartite meeting was held at the Federal Ministry of Education conference room, with ASUP representatives led by its President, Dr. Chibuzor Asomugha, while the National Association of Polytechnic Students (NAPS) was led by its president, Comrade Sunday Ogbonnaya. Trouble started when Ogbonnaya, who was called first to give his opening remark at the meeting, attacked the ASUP leadership for pursuing its selfish agenda to the detriment of the students. He was aggrieved that the key issue of dichotomy between the Higher National Diploma (HND) and University B.SC degree was ostensibly removed from the four out of the 13 key issues agreed on by both the federal government and ASUP to be resolved immediately. But the ASUP president, who was visibly enraged that the students were invited to insult the lecturers, said it was strange that the students were called for the meeting and allowed to make their remarks first without being properly debriefed on the essence of the meeting. He further stated he doubted the sincerity of the federal government over the meeting. However, Wike told ASUP the ministry which invited them for the meeting had the right to alter the agenda for the meeting. He also refuted the allegation that ASUP was abandoned, listing the meeting with the Minister of Labour and Productivity, Chief Emeka Wogu in December last year and an unofficial meeting he held with the ASUP leadership in his office at a different occasion after the October meeting, all aimed at resolving the impasse.